​Just when you think there may be some common sense progress, the NFL found a way to rear its idiotic head. According to Albert Breer, NFL owners are considering slapping teams with a 15-yard penalty if they come out for the anthem and choose to kneel. ​​Really? 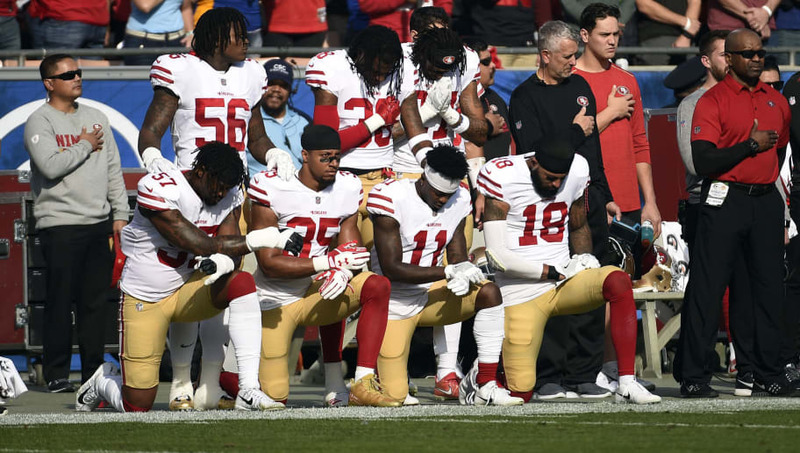 In the face of ​collusion grievance cases from ​Colin Kaepernick and Eric Reid, the genius NFL owners respond by throwing around the hypothetical of penalizing teams if their players choose not to stand for the anthem. Regardless of your stance on players kneeling for the anthem, there should be a common sense distinction between players political beliefs and how they are treated on the field. There should be a general respect for them as players that allows them to express political beliefs without fear that they'll be subjected to penalties because the owners disagree. Quite literally hundreds of players decided to kneel over the course of last season for various reasons. So what does the NFL do when half a team protests? Hit them with penalties of several hundred yards? Waste several minutes of TV time with a referee announcing the penalties to the fans in attendance as they do every other penalty? Oh, better yet, I guess we'll just watch the kickoff get booted into the stands. Fun. This idea makes no sense on multiple levels, but then again, NFL owners and league officials haven't always proven to be the brightest bunch. We'll have to wait and see if they move forward with this.